How much money do you make? 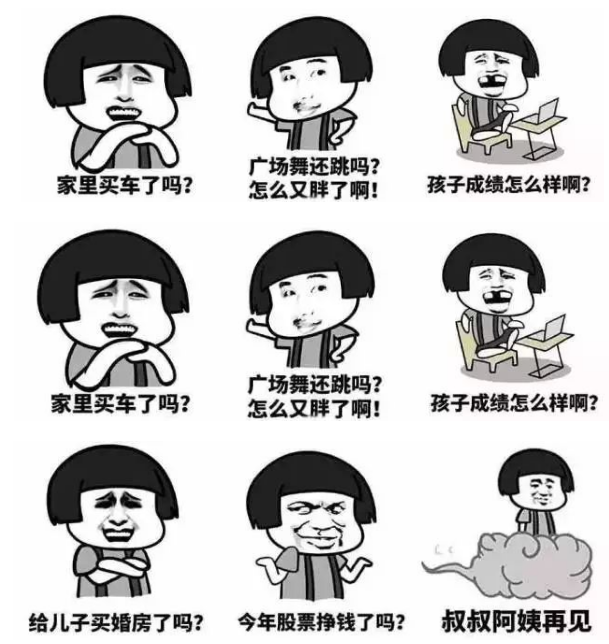 工资多少? Do you own a house? 有房么? You seem like a decent person. Why aren't you married? 小伙子看起来不错，咋还没结婚呢? Which is better, living in US or China? No, I’m currently working on improving myself. I believe that will help me find a suitable mate who will make me and my parents happy. But once I get married, I won’t receive red envelope from you anymore. We love babies! If only we could have a child as obedient as my nephew. By the way, which brand of infant formula do you recommend? I shouldn’t trust domestic ones, right? Are you fatter than last year? Work has been so busy, and I have so many responsibilities that I haven’t found the time to exercise regularly. Why don’t you move closer home to work? Work is going really well for me right now, and you just don’t get the same opportunities back home. But I do miss my parents very much, and I call them every week.